The article “Did You Know? A Collection of University Esoterica” [Winter 2009] reminded me of a question I’ve had in my mind for a long time. I’ve heard it said that Auburn University and the University of Virginia have the same school colors because Virginia helped Auburn establish its football team—and Auburn wanted to show appreciation. Is there any truth to this story? An 1887 University of Virginia graduate, George Petrie, was the organizer and coach of Auburn’s first football team in 1892. In honor of UVA, Petrie chose orange and blue as Auburn’s official colors. His contributions to Auburn didn’t end there; Petrie was the founder of the school’s history department, graduate school and athletics department, as well as the author of the Auburn Creed.—Ed. With regard to the article on the mascot Seal, when then-Sen. Joseph McCarthy visited the University on a speaking engagement, Seal wandered onto the stage. McCarthy showed his true colors by asking for the dog to be removed. My memory is that no one complied and eventually Seal, deciding that the speech wasn’t worth listening to, strolled off the stage on his own. The audience enjoyed Seal more than they did the senator. Jesse Beams, my research professor from 1956 to 1958, was the president of the American Physical Society during those two years. While your article about him (“Did You Know?”) said that he had been successful in his efforts to assist the Manhattan Project, it failed to say that he had been the first person to separate the isotopes of uranium. Nor did it say that he had been very unhappy to have been selected for the Manhattan Project because it took him away from his primary love at the time: Goddard’s rocketry. The very morning after Sputnik surprised the world, Beams told me that there would be men in space and that they would be called astronauts and wanted me to design a two-year curriculum for them. Being president of the American Physical Society after being on the Manhattan Project hadn’t slowed him down from thinking ahead into the vast universe (and, of course, capitalizing on that by preparing for a new type of student for the University). 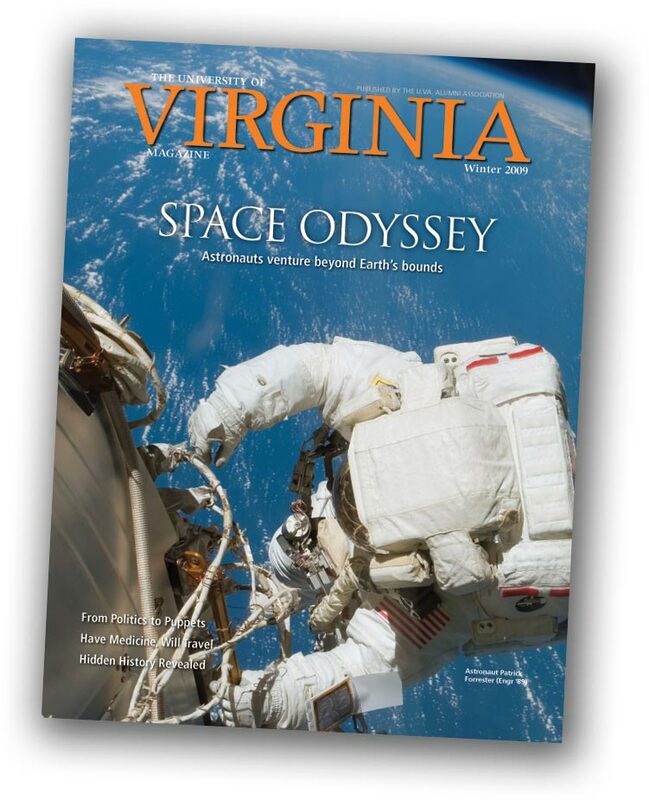 The article “Space Odyssey: Astronauts Venture Beyond Earth’s Bounds” and the UVA alumni [in the space program] caught my attention. I am a 1955 graduate with a BSME degree. After doing research for NACA in 1958, I joined the Space Task Group of NACA. This was the start for manned space flight programs. NACA became NASA. And I spent two years at Cape Canaveral as a project engineer on Project Mercury, working with Alan Shepard, Gus Grissom and John Glenn. After John Glenn’s flight, I transferred to Houston and was one of the first in Houston to work on the early plans for the Apollo program. In Houston, I worked with a UVA classmate, Ray Zedekar, who was also a 1955 BSME grad. Ray worked in the astronaut office. So, UVA had very early alumni representation on the man-in-space programs. I received the most recent copy of Virginia Magazine and was greeted by a picture of Tony Bennett, the new men’s basketball coach. In the background is a ball proudly proclaiming Virginia the NIT champs of 1980. That was 29 years ago. What has happened in those 29 years? Well, the New York Yankees have won five World Series; the San Francisco 49ers have won four Super Bowls; North Carolina has won nine ACC basketball championships; Duke has won 12 ACC basketball championships; and Virginia has won one other NIT championship [in 1992]. Seems like some organizations know how to win on a consistent basis, just like some organizations know how to lose on a consistent basis. This is nothing more and nothing less than a management problem. Players win games, and coaches lose them. Let’s turn this problem over to our highly ranked undergraduate business program and let them have a chance at fixing it. They won’t do any worse than those in charge the past 29 years, and they might do a lot better. In any event, they will learn valuable lessons about leadership. I am disappointed that the University fired [head football coach] Al Groh. Someone, I believe, has their priorities wrong, and they are sending the wrong message about where our University has placed its values. It is virtually impossible to recruit the type of elite athletes who can succeed at a very academically competitive university like Virginia. Indeed, I suspect our ranking as one of the best and most academically challenging universities in the country scares away some of the more academically challenged, athletically gifted players. Can you name for me a single university that ranks ahead of UVA academically that also fields a top 25 football team? I would rather have our University be at the top academically and not be so concerned about where we rank in football. The two, I submit, are mutually exclusive. On reading “Food for Thought” [Winter 2009], I felt congratulations to the University were in order. As a first-year student, I ate a greenish-gray hot dog, after which I broke out in hives and felt my windpipe closing up. Thanks to the quick action of my RA and some Benadryl from the emergency room, I recovered without major incident. For a variety of reasons I am a vegetarian now, and that experience with the deleterious hot dog was the beginning of my meatless future. The point is that food can hurt us or help us, and I’m glad the University is paying closer attention to the food choices it offers students. Thank you for the wonderful “Retrospect” photograph of 1948 UVA wives and babies found in the Spring 2009 edition. 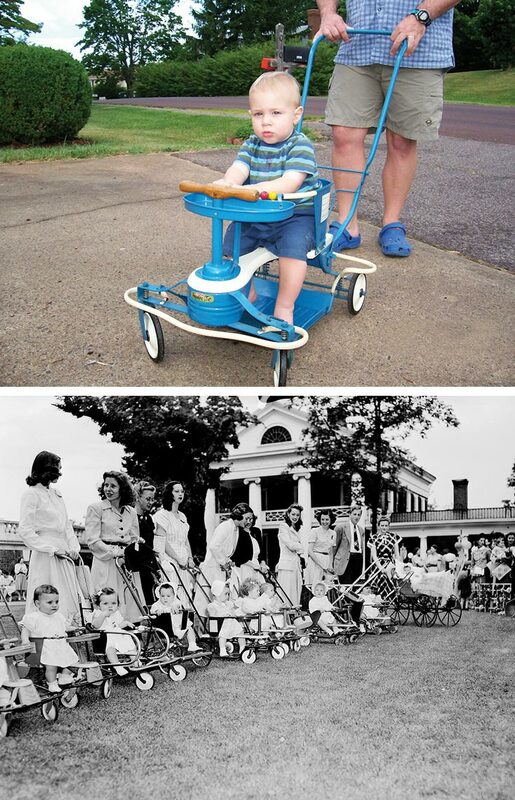 I am not in the photograph, but I do have a vintage Taylor-Tot stroller such as those pictured. After the death of my father in 1995, I spent a few days cleaning out the family home in Fairfax with my brother and sister. In the far recesses of the garage loft, I espied a baby stroller. I was delighted to find it, even though I had no expected use for it. That circumstance changed in 2006 with the birth of our first grandson, and three months later of our first granddaughter.